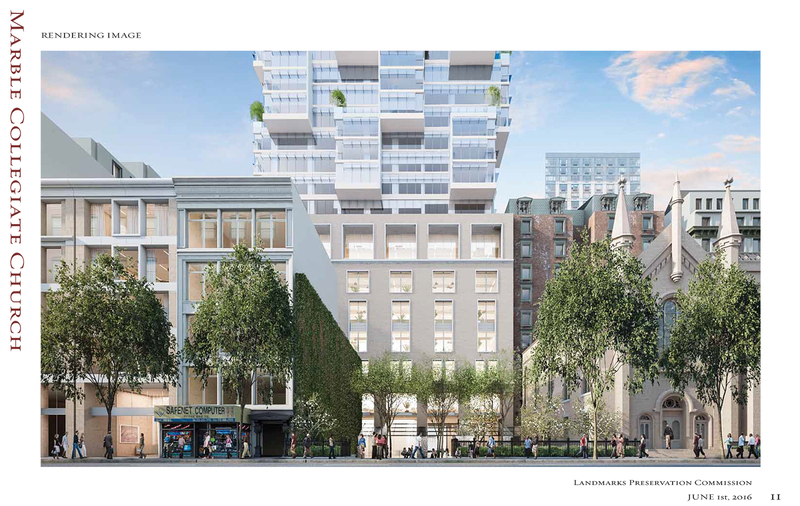 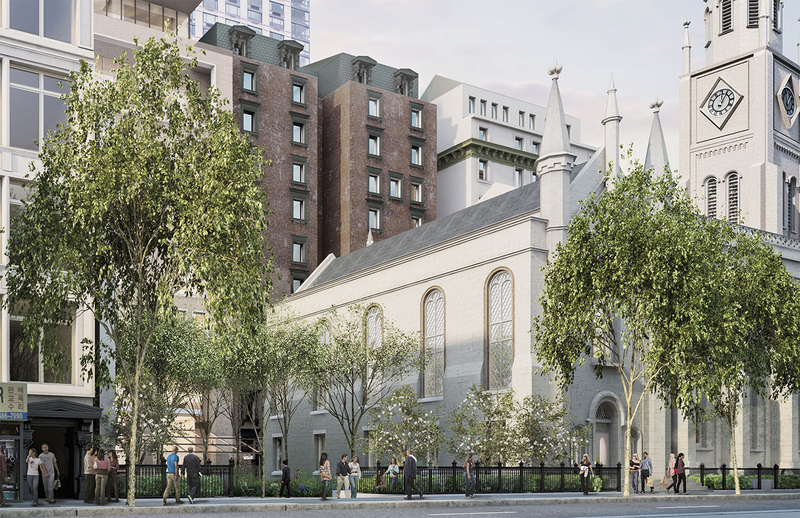 A block a little north of Madison Square Park is on its way to a major transformation, thanks to action by the Landmarks Preservation Commission on Tuesday. 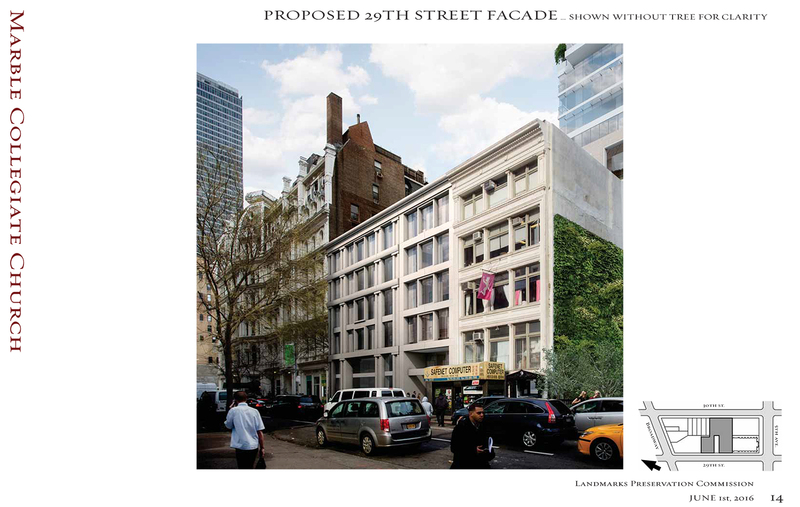 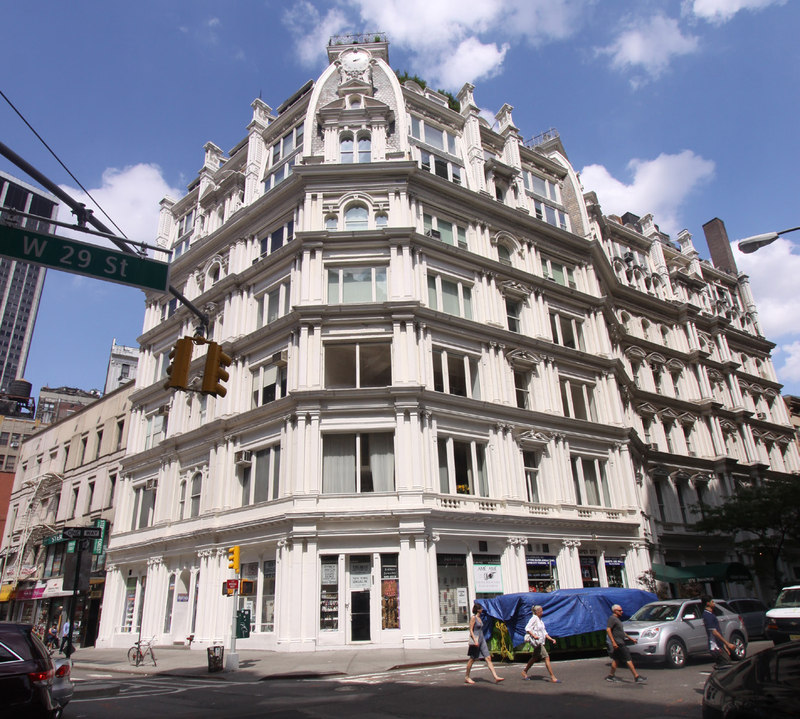 The block in question is between Fifth Avenue and Broadway, on West 29th Street and part of West 30th Street. 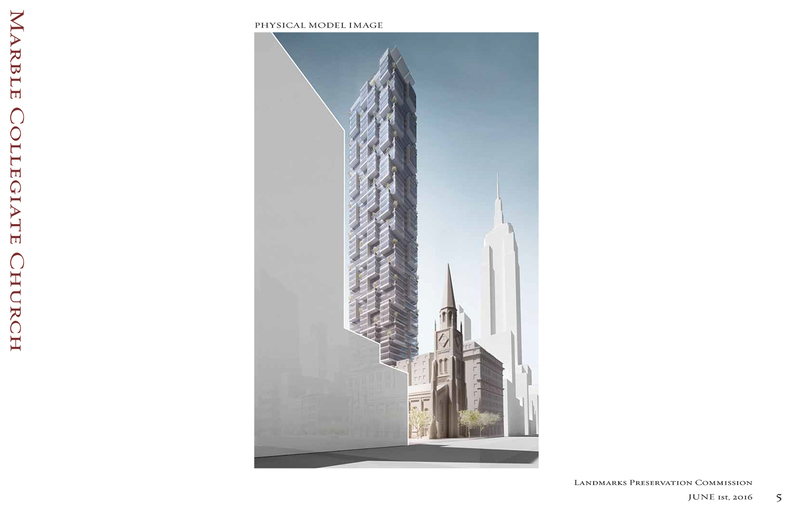 Developer HFZ Capital Group wants to build a 64-story, 796-foot-tall, mildly Jenga-esque mixed-use tower designed by architect at 8 West 30th Street. 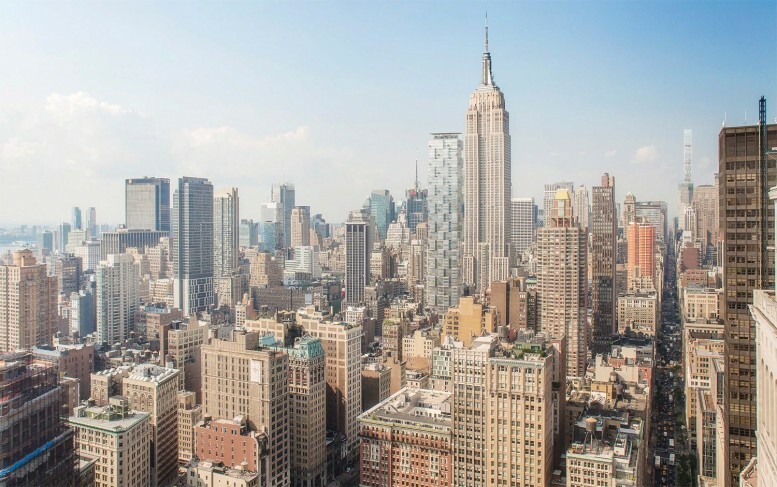 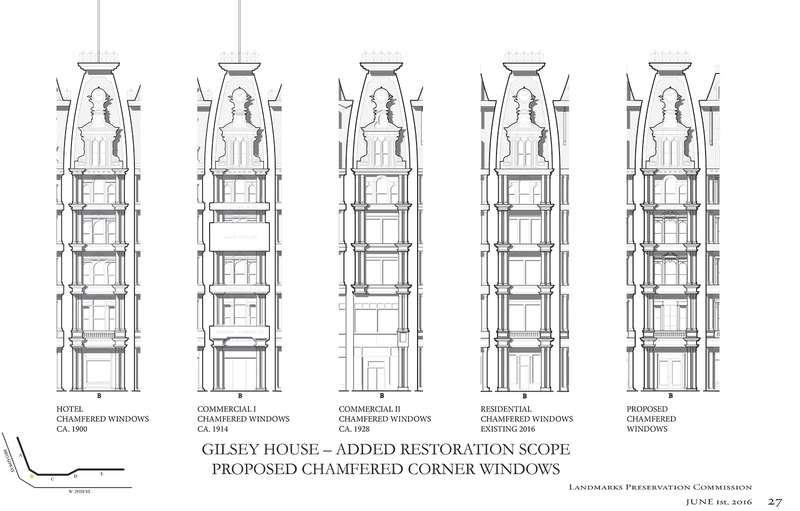 In order to do that, it needs air rights from neighboring properties including the landmarked Marble Collegiate Church at 1 West 29th Street and landmarked Gilsey House at 1200 Broadway. 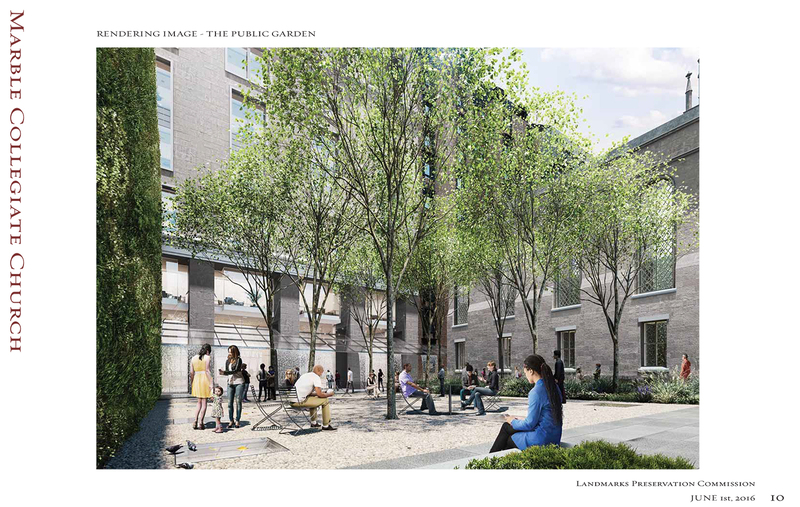 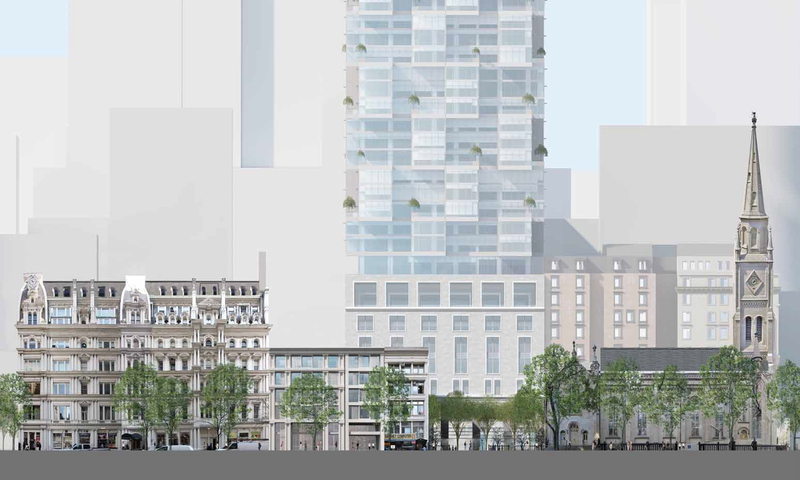 HFZ is trying to get those rights via a 74-711 application, which means they are responsible for both making sure the new building’s base is harmonious with the landmarks and that the landmarks themselves are kept up. 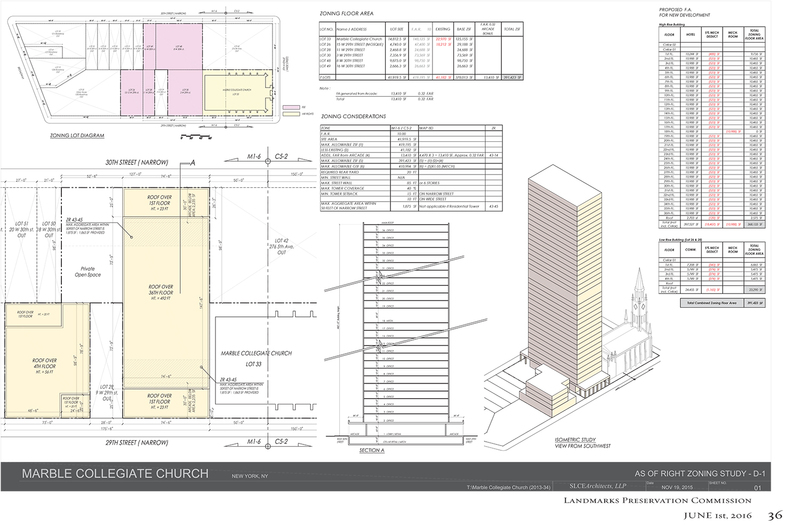 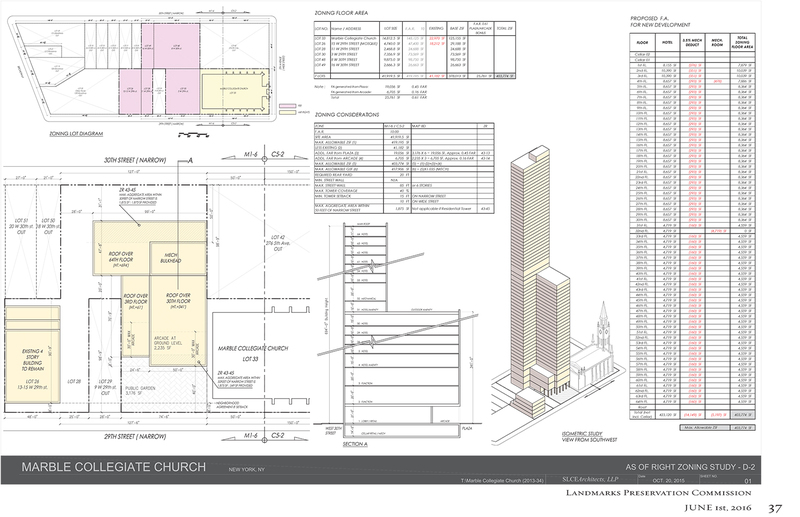 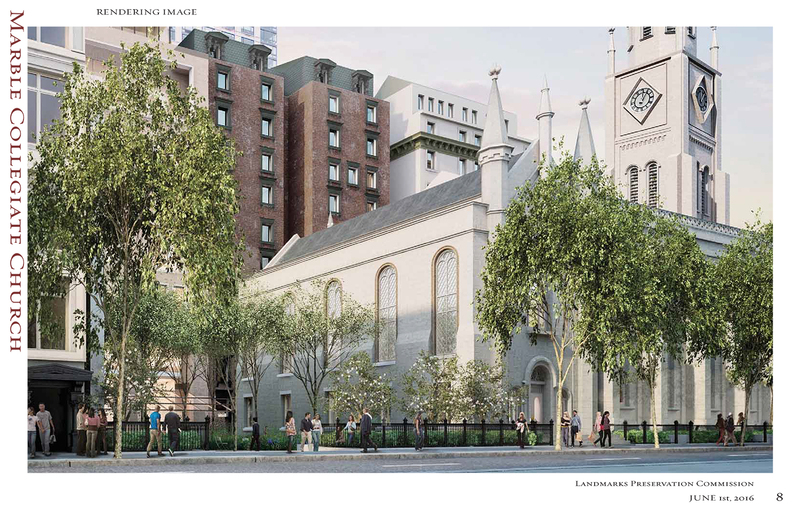 When the commissioners weighed in on the proposal in February, they found their way to agreeing on the base of the tower and the restoration of the church, which will include giving it a new north western facade. 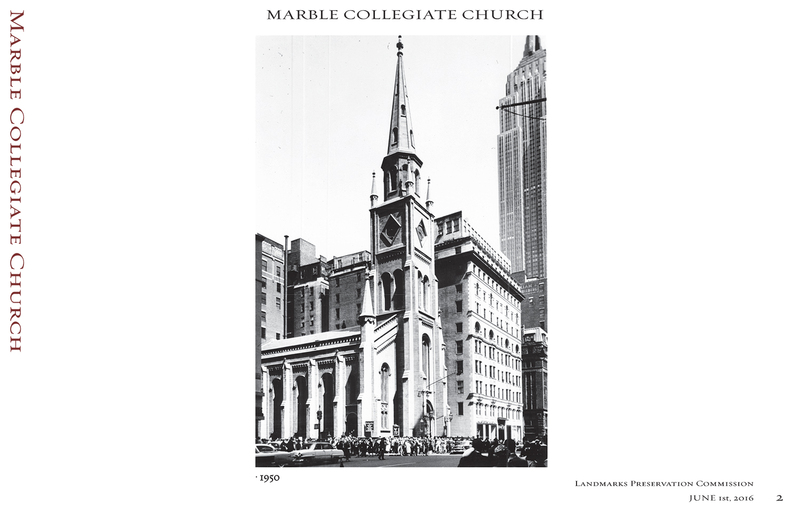 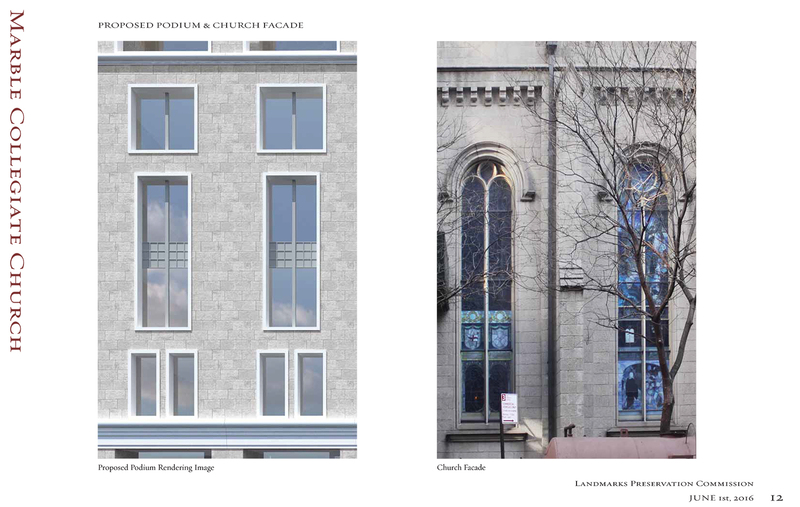 Proposed new western facade for the Marble Collegiate Church. 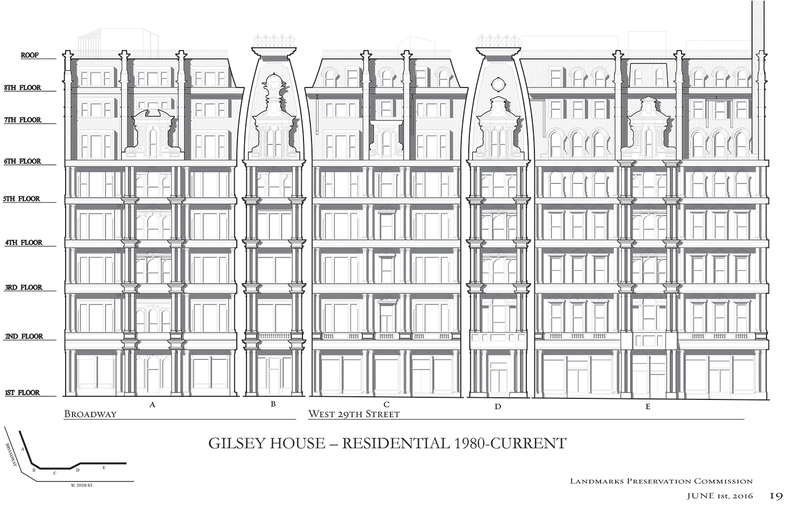 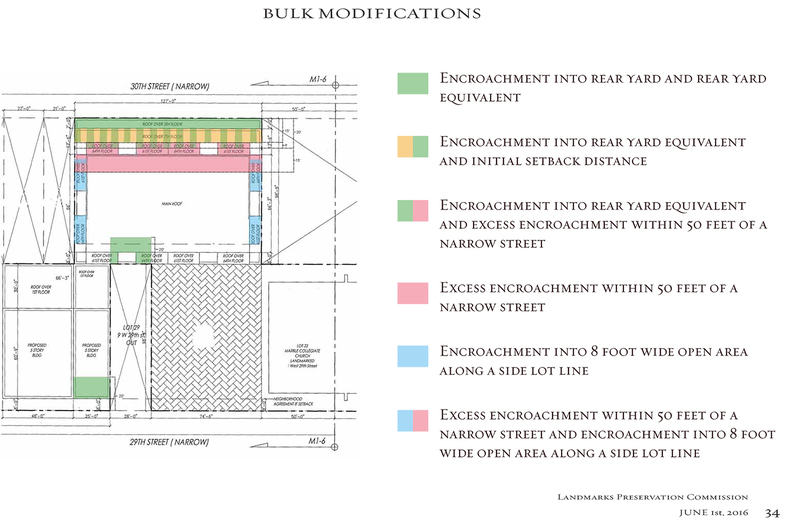 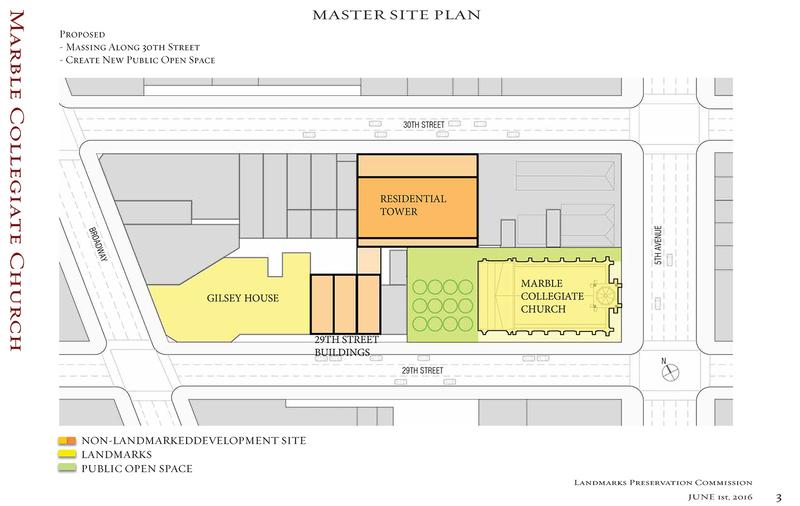 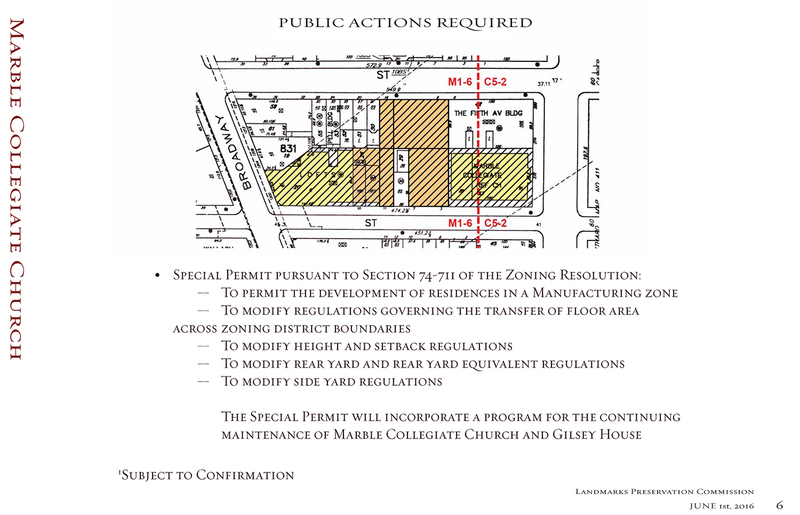 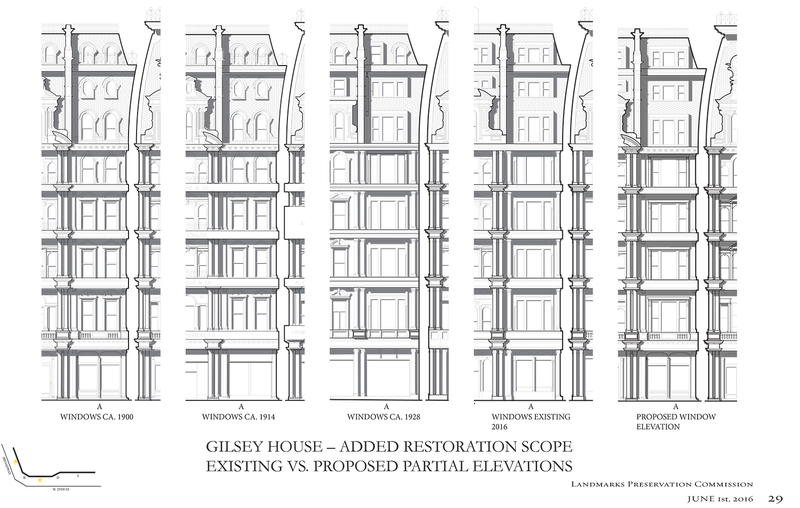 The proposal also calls for the demolition of three row houses to the east of Gilsey House and construction of new structures in their place, which would, in part, house the mosque there now. 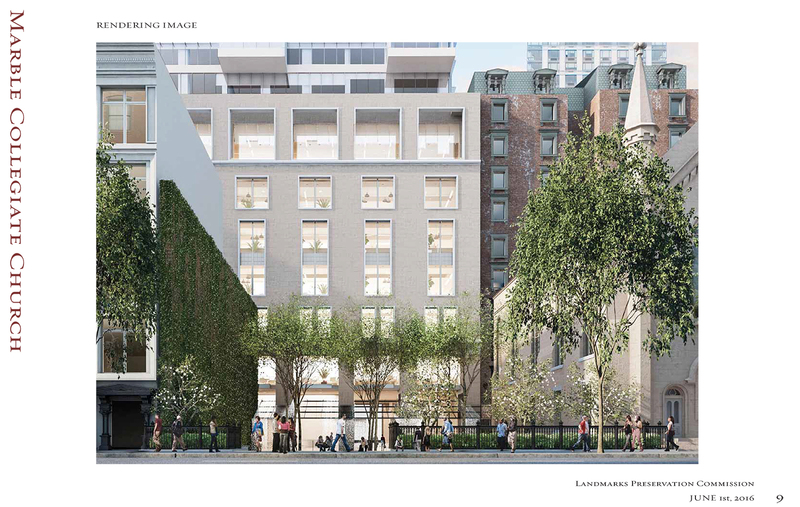 Additionally, a park would be created where the Bancroft Building stood, under which would be a church facility partly lit via skylights. 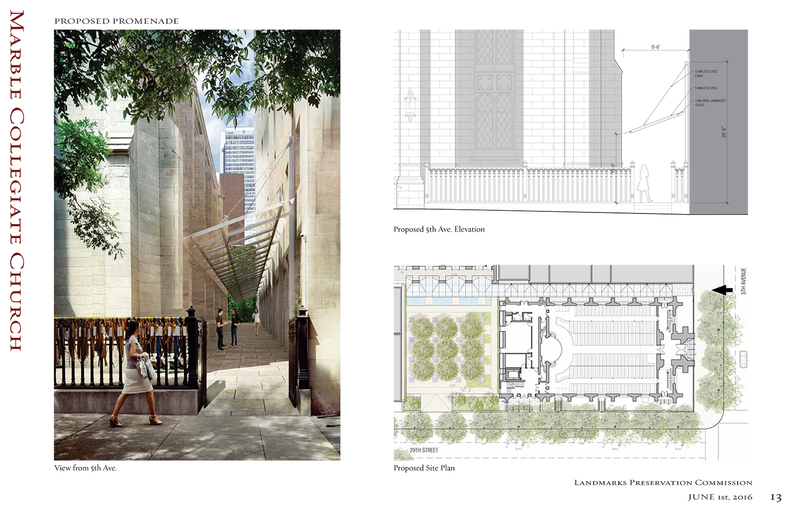 The executive building north of the church would also be demolished and canopied pedestrian passageway would be put in its place. 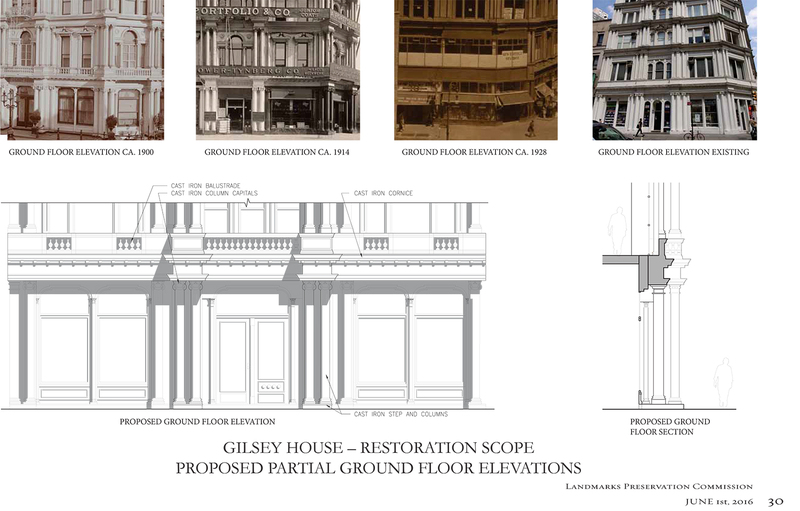 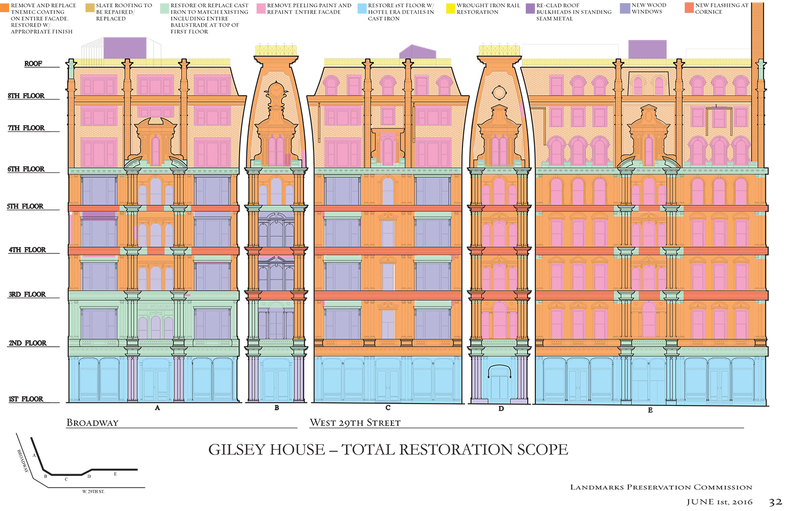 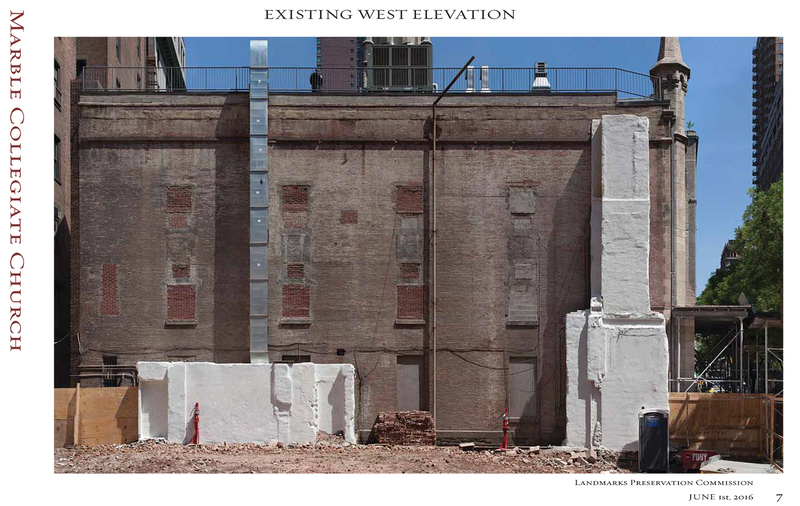 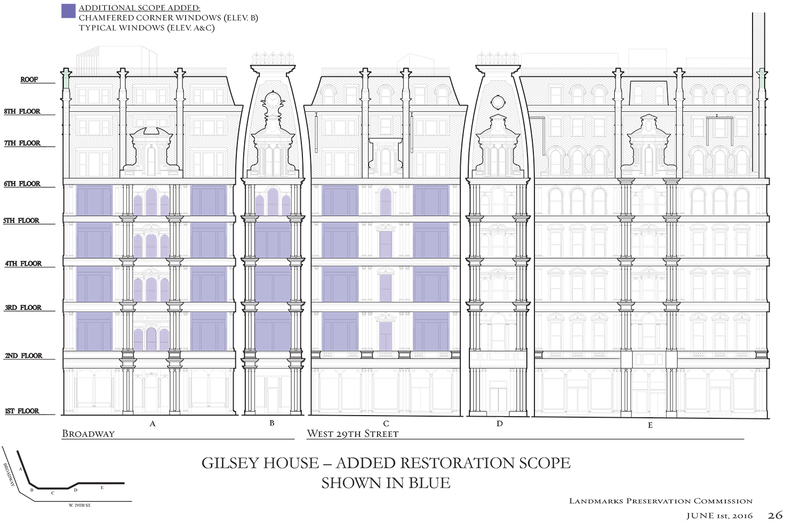 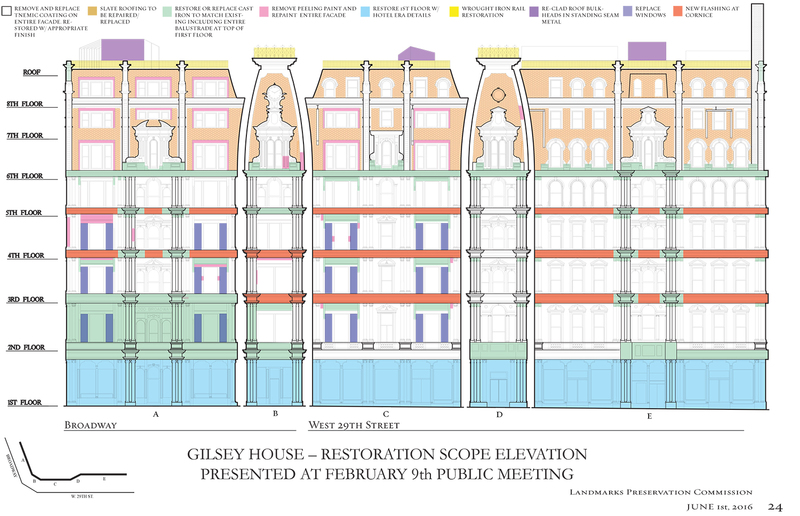 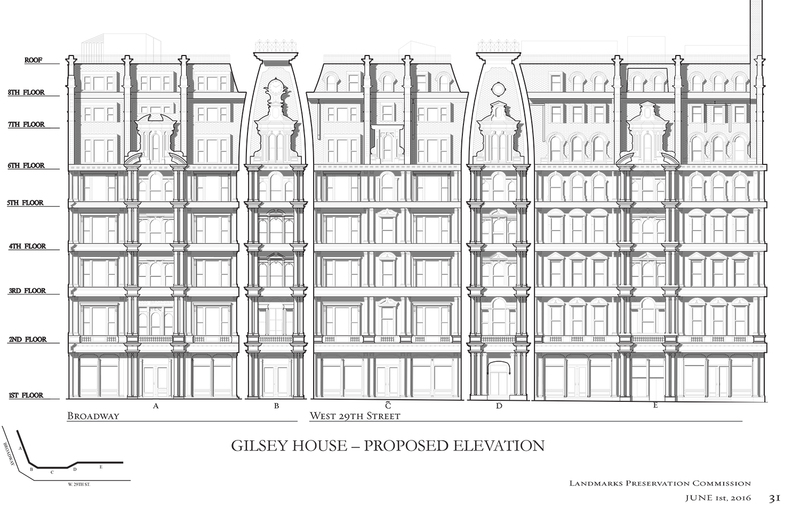 All that met the level of approval by the LPC, but not the restoration of Gilsey House. 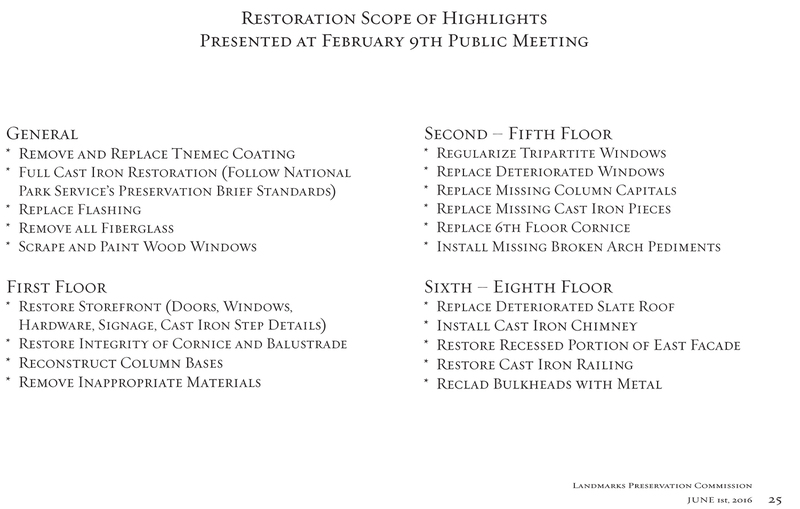 Some of the commissioners wanted the restoration to be closert to the documented condition of the structure in 1900, instead of the proposed 1940. 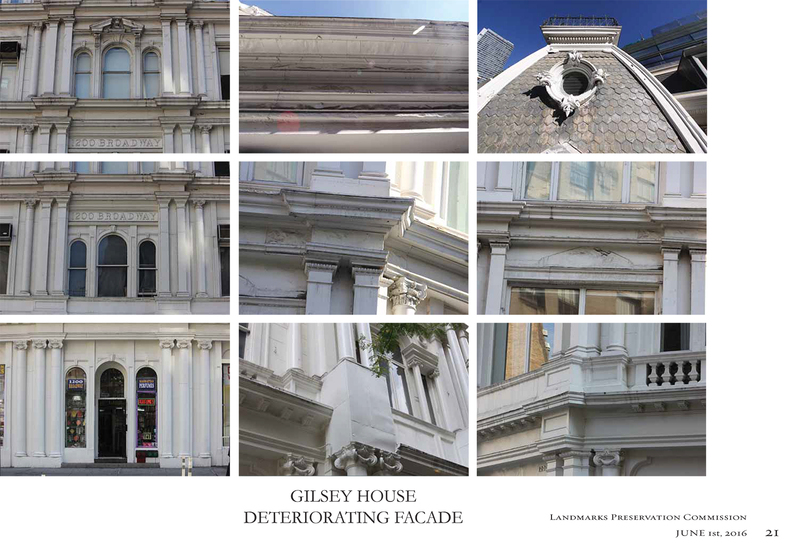 So, the team, including preservation consultant Bill Higgins of Higgins Quasebarth & Partners went back to work. 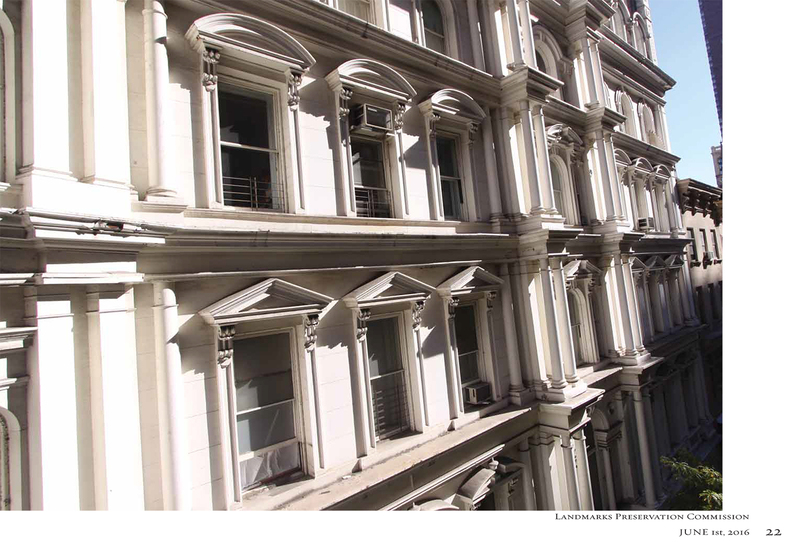 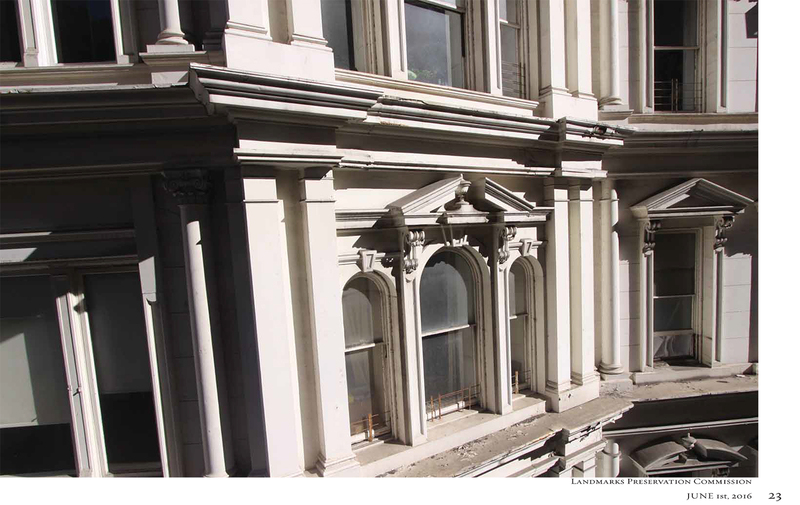 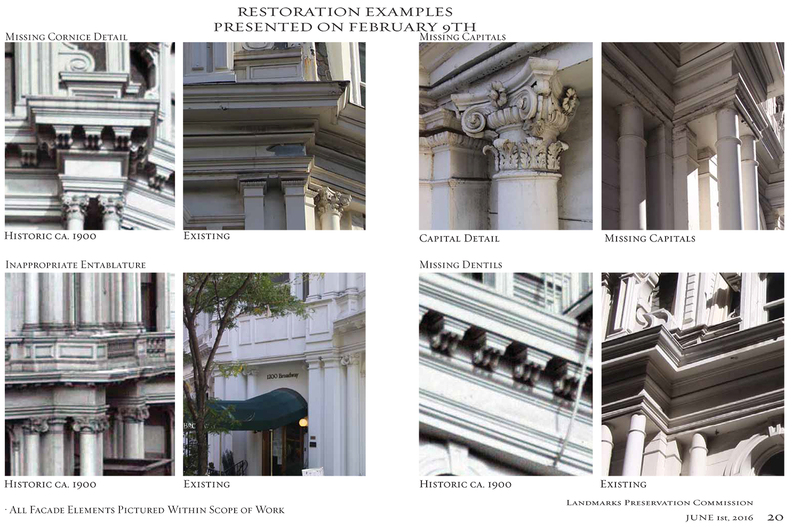 Higgins said they have added to “the scope of architectural improvement” by improving chamfered windows, restoring them to the documented 1900 condition, and also making improvements to tripartite windows. 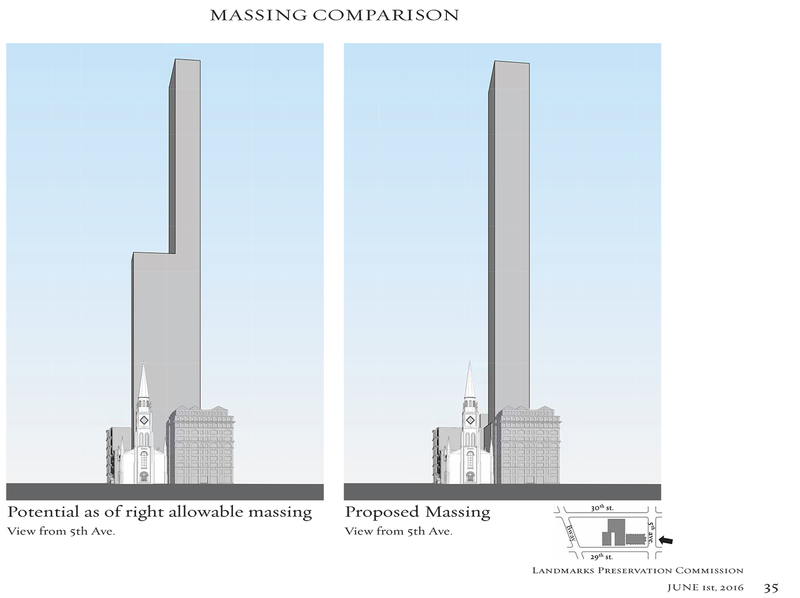 This won over the commissioners. 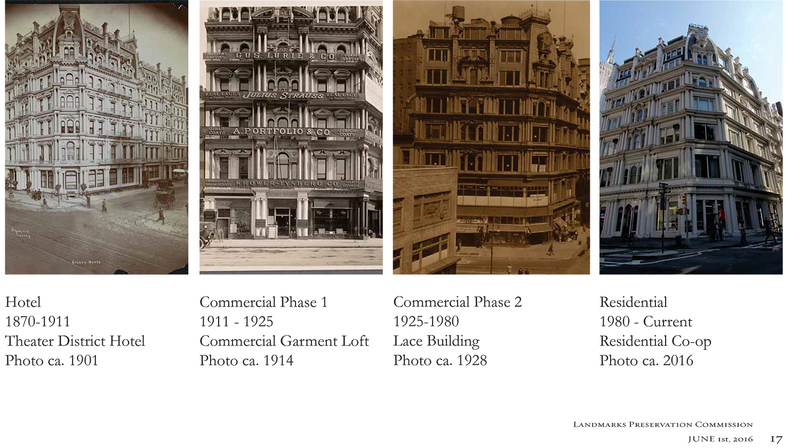 “The building is rich because of its history,” LPC Chair Meenakshi Srinivasan said. 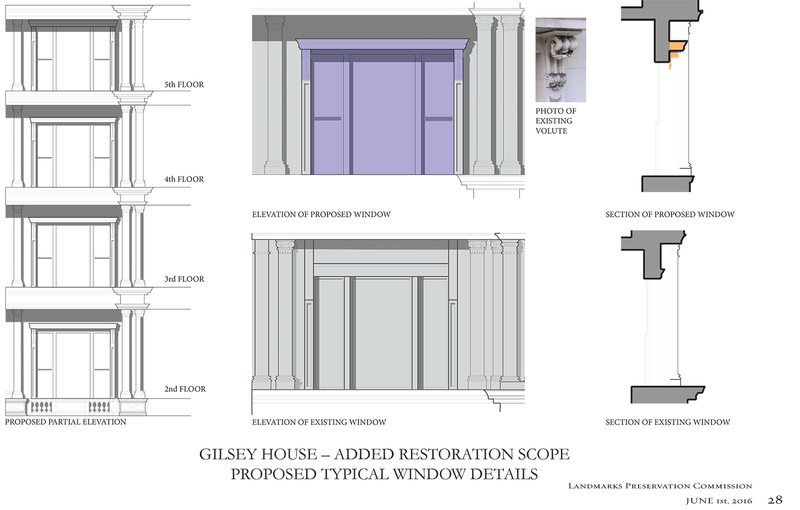 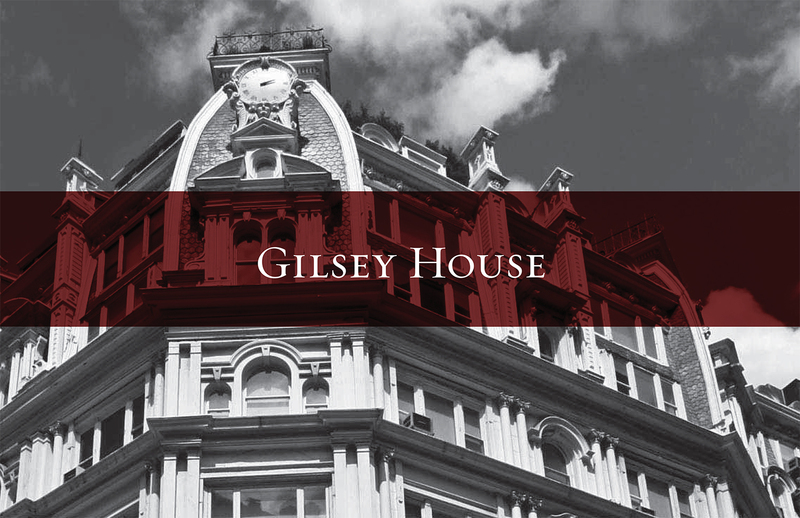 She called the proposal a “very rich plan” that will make Gilsey House more beautiful and increase its longevity. 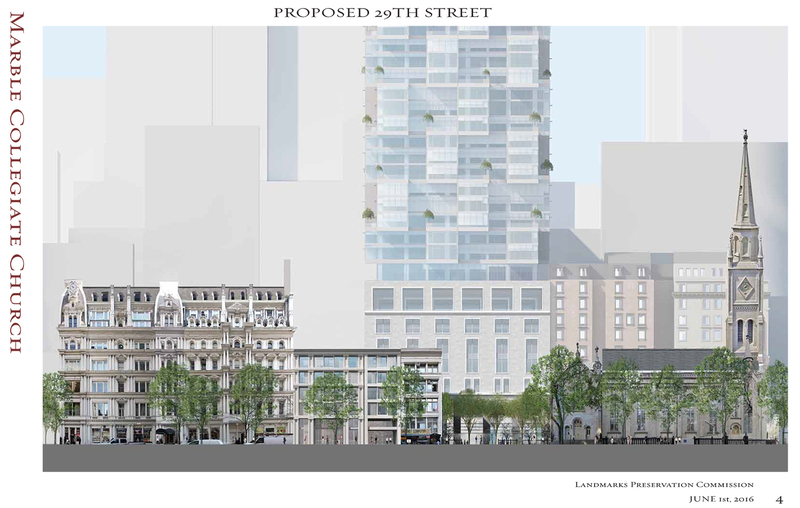 Commissioner Michael Goldblum still wasn’t satisfied with the proposal. 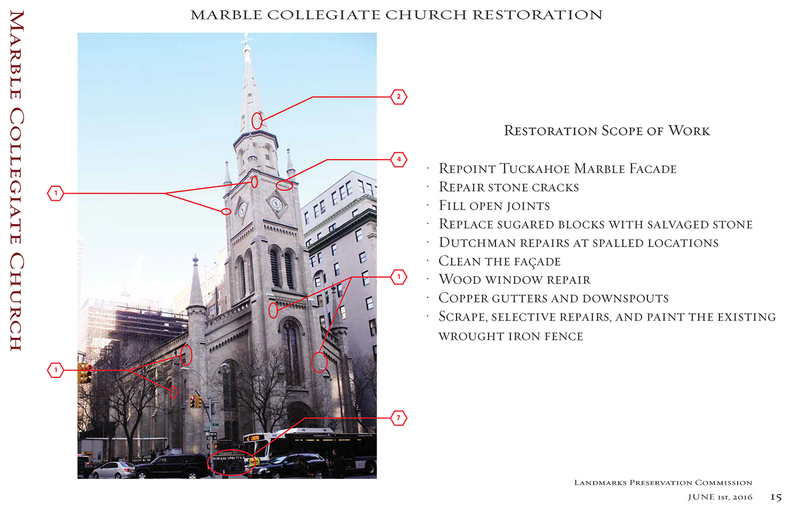 “A more careful restoration would be in order,” he said, adding that he still didn’t like the new fourth façade for the church. 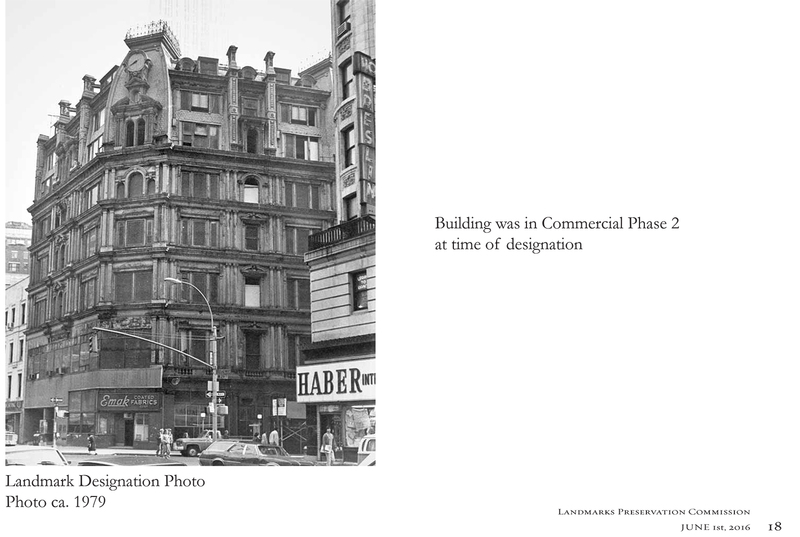 With so much already having been said, Commissioner Frederick Bland reiterated his support for the design of the Safdie building. 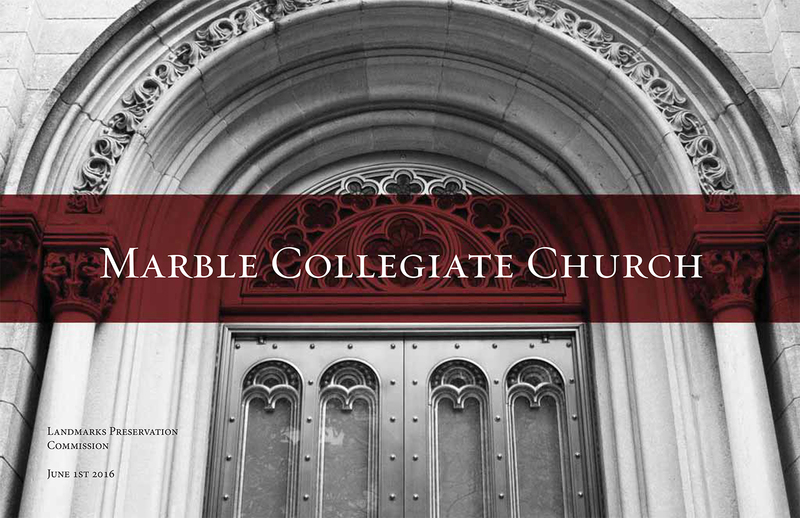 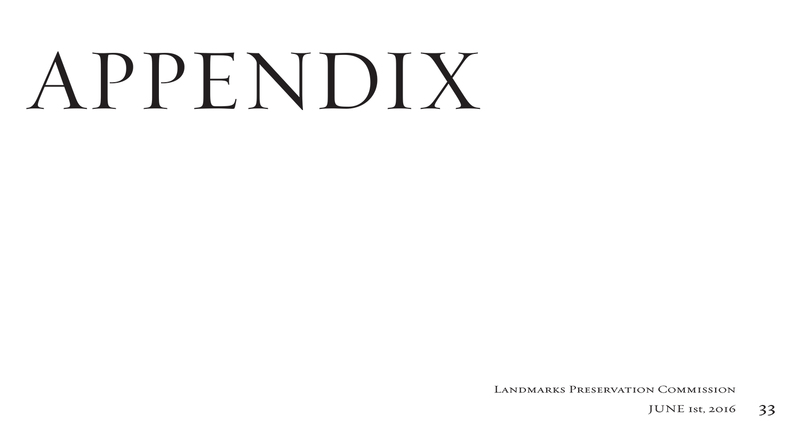 View the full presentation slides below.